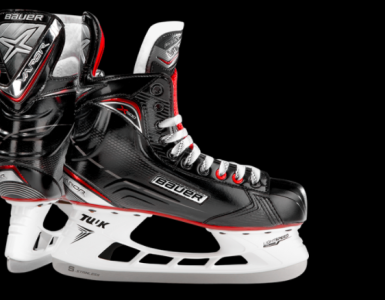 Bauer are normally ahead of the game when it comes to producing high-tech, high-performance, and high-comfort skates. They don’t shy away from releasing new and improved models of their ever-popular Supreme, Nexus, and Vapour skates, but where does that leave the previous models, and are they still worth a look? The Bauer Vapour X50 have been on the market for a while now, featuring an enhanced design in comparison to their predecessor, the Bauer Vapour X40. Considered an affordable and high-quality Bauer skate for those just getting to grips with life on the ice and looking to enhance their performance in the fast lane, this model has plenty to offer. 4 How Do the Bauer Vapour x50 Skates Perform? We’ll be taking a look at the Bauer Vapour x50 in a size 9.0 D for our test, which weighs in at only 773g – pretty lightweight for a Bauer skate. Like all models of Bauer Vapour skate, the Vapour X50 skate is designed with a tapered fit, suited to skaters with slightly narrower feet and a narrower heel. The Vapour X50 is fairly well-known for it’s lightweight and comfortable design, and the comfort is definitely on point with these skates. 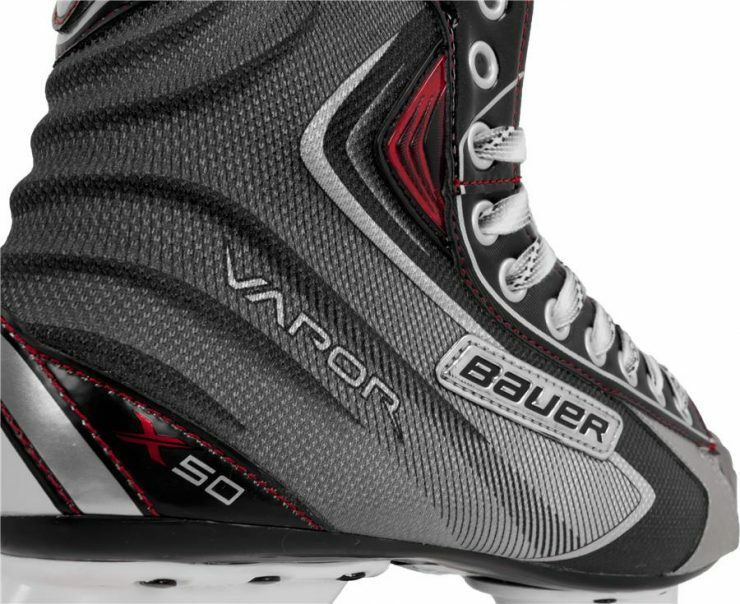 Appearance-wise the Bauer Vapour X50 is almost indistinguishable from the Bauer Vapour X40, or even the next model to be introduced, the Bauer Vapour X60. Apart from the boosted tech, the main difference between these skates and the previous model is the ‘X50’ written on the heel. The skates are designed in black, white, and grey with red highlights – a very sleek look. With the contrast between the pure white TUUK Lightweight Pro holders and the darker boot design, these are certainly impressive looking skates. Overall, the skates look very aesthetically appealing, and if you enjoy the look of the X40, then there’s no reason why these skates shouldn’t hit the mark. From the first time you wear the Vapour X50 skates, it’s very clear that comfort has been a key consideration in the design, and a consistent aspect of each part of the skate. The footbed has Moulded Comfort EVA to keep your foot in the right place, the Anaform foam is light, and the microfiber liner is incredibly comfortable. As long as the tech performs as well as you would expect from a Bauer skate, these skates are already well on their way to being a great choice. Warranty: Holders – 1 year. Runners and boots – 90 days. How Do the Bauer Vapour x50 Skates Perform? With the sleek design and comfortable, lightweight fit, you’d hope that the Bauer Vapour X50 skates can continue the winning theme and deliver some high performance out on the ice. From the technical details, its already pretty clear that these skates are a step-up from the X40 edition, and there are a couple key features that make them really shine. The Thermoformed X-Rib on the Bauer Vapour X50’s is an interesting feature, that noticeably impacts your skating. 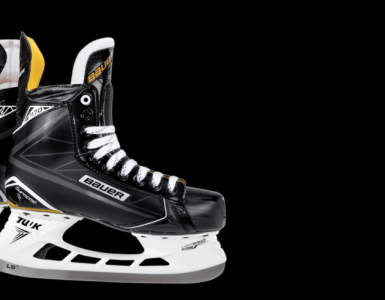 The new rigid design of the X50’s, with the straight-wall construction of the boot, features the unique X-Rib that has been used in a fair few of Bauer’s top skates. The X-Rib provides increased support (always something you want to hear), and increased stability. This all translates into a boot that feels good on the ice but also gives you the ability to accelerate faster and turn much quicker. Combined with the Sublimated Woven Nylon for precise fitting and the tech mesh in the quarter package, these skates are going to really help your forward flex. Boasting a 2-piece felt design, the anatomical tongue of the Vapour X50 is designed to contour to the foot with a sturdy and supportive metatarsal guard – ensuring your ankles are safeguarded against any stray pucks. Through the anatomical moulding, the tongue is designed to allow for an easier flex forwards, which it certainly delivers upon. This contributes to the overall supportive feel of the skate, making you feel more secure whilst on the ice and delivering a boost in confidence when you need it the most. With the addition of the light but protective Anaform ankle support, the skate provides a very good fit. When the Bauer Vapour X50 originally hit the market, the TUUK Lightweight Pro holder was considered to be amongst the best holders around, and the performance offered is still superb. With the addition of the Duel Density Bevelled TPR, which is an upgrade from the X40, the skate benefits from an enhanced rigidity. This becomes apparent when you’re out on the ice, with each stride having a heightened energy transfer. If you’re looking for a skate that is going to work with you as you develop your performance, then this increased transfer of energy is going to really help you out. The skate also features the TUUK Stainless Steel blade – a classic and high-performance blade. The only downside to the design of the runner, is that the blade can’t be changed. This won’t be a problem for some, but it does somewhat limit the lifespan of the skate. Theres no disguising the fact that the Bauer Vapour X50 skates are not the latest and greatest development from Bauer; the TUUK Lightweight Pro blade holders don’t quite match up to the TUUK LightSpeed Edge holders in the X60, and theres no holder quick release, like in some later models. 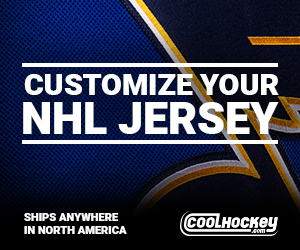 However, the Bauer Vapour X50 skates more than deliver on the promised performance and fit with an enhanced design. Overall, these skates are designed to boost your performance when you’re at the tentative stage of needing a slightly better skate to match your own increasing ability. 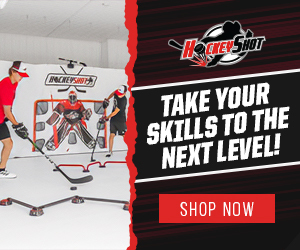 In this sense, the Bauer Vapour X50 are an excellent choice, giving you the support, flexibility, and performance boost you need to keep improving your game.